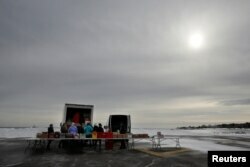 Volunteers and staff of Gather food pantry set up as they prepare to distribute food to members of the U.S. Coast Guard, who are working without pay during the government shutdown, at the U.S. Coast Guard Portsmouth Harbor base in New Castle, N.H., Jan. 23, 2019. 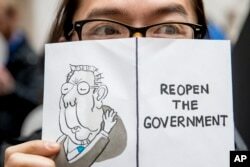 A furloughed government worker affected by the shutdown holds a sign that reads "Reopen the Government" during a silent protest against the ongoing partial government shutdown on Capitol Hill in Washington, Jan. 23, 2019. 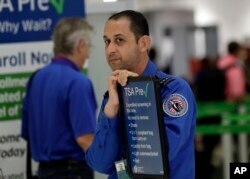 A Transportation Security Administration employee works at a security checkpoint at Miami International Airport, Jan. 18, 2019, in Miami.